Lunenburg! To a kid growing up in Canada in the 50’s the city that was home to the famous Bluenose schooner commanded the same reverence as the Montreal Canadiens or the Toronto Maple Leafs – at the time our only NHL teams. Every Canadian kid read stories of the adventures of the Bluenose in school readers, and a facsimile of the beautiful ship still decorates one side of our Canadian dime. 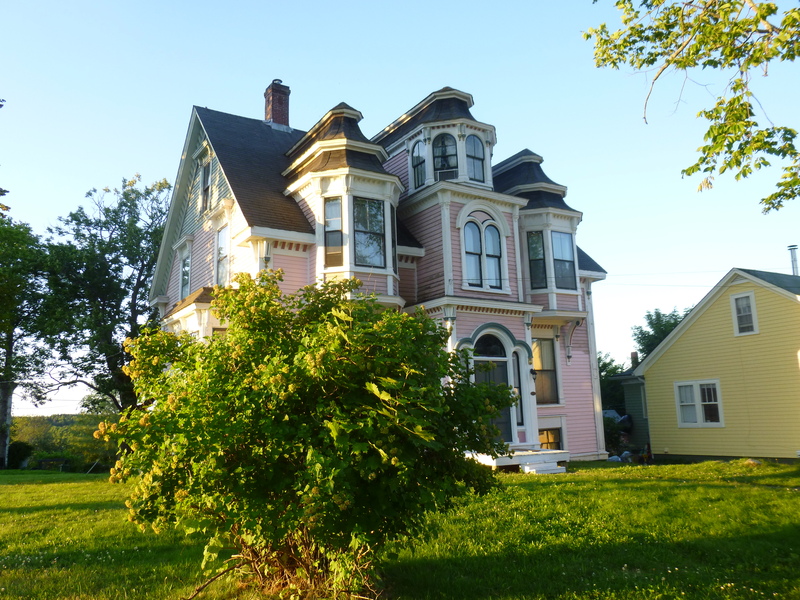 Lunenburg is a UNESCO World Heritage Site by virtue of the many well-preserved 17th and 18th century homes and buildings that line the streets for several blocks in any direction from the waterfront. 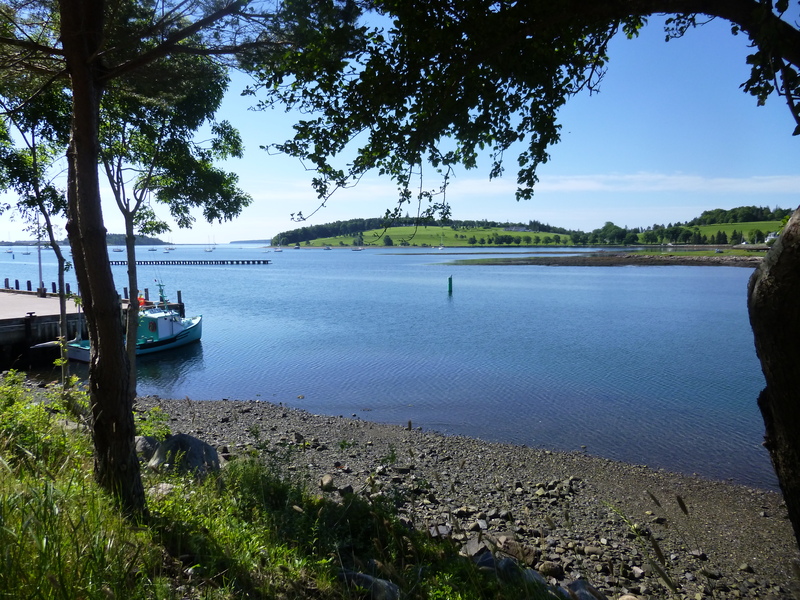 The large, sheltered harbour suited the shipbuilding industry on which Lunenburg flourished, and ship builders and chandlery’s continue to share the waterfront with vintage sailing and fishing vessels, busy marinas and tourist attractions. 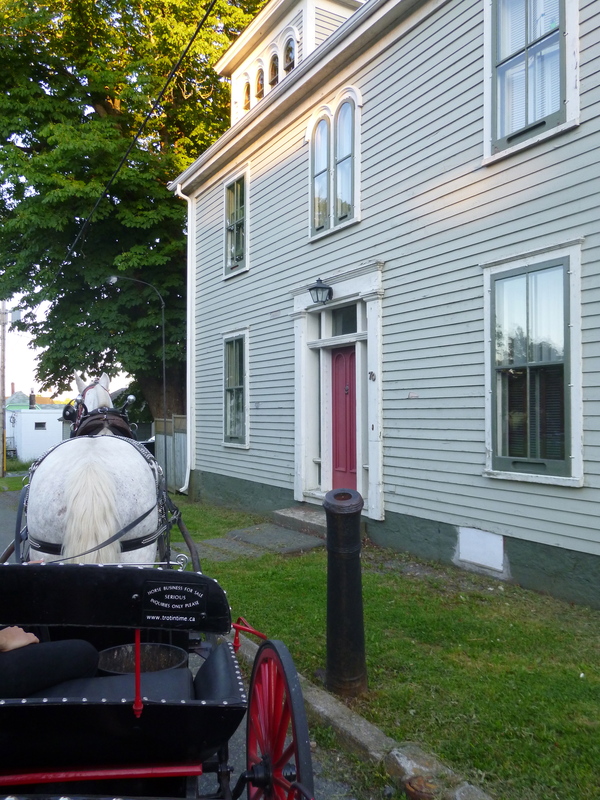 Horse-drawn carriages offer an enchanting way to tour the original neighbourhoods of Lunenburg and make it much easier to get up and down the streets of the hillside town. The tour guides-come-carriage drivers are very knowledgeable and were happy to take as much time as required for good photographs. Our dappled Percheron, “Charlie” stole the show by seeming to respond with good nature to spoken commands – “Hold up here, Charlie there’s a car coming…” or “Okay Charlie, we can go now…” or “No, Charlie it’s not time to go home yet”. I was so impressed that I tried him out on “Well, Charlie how about a latte at the nearest Starbucks?” but I guess that’s not part of his vocabulary yet. Little signs on the seat backs in the carriage say “This business is For Sale. Enquiries Welcome”. Charlie (the horse) waiting patiently for his next fare. A good example of the efficient architecture of the times – this building was originally a ships chandler or provisioner. Modest house – note the low doorway. I’m guessing the sailors of the day were stocky but not very tall? Shaker style house quite typical of the times – and Charlie’s business end. Does the black post sticking out of the ground look like the business end of a cannon? It is. The owner of this house, on a corner at the bottom of a steep hill, got so tired of wagons skidding down the hill into the front of his house that he dug a huge hole and planted an entire cannon to remedy the situation. It apparently worked. Even by today’s standards this is still a mansion. Note the lookout on the top floor, a feature in many seaside homes that allowed families to scan the harbour mouth for signs of their men returning home from sea. The Bluenose Golf and Country Club sits on a peninsula directly across from Lunenburg’s downtown. It was built on farm land leased out to the club that was established in 1930, and continues to be leased by the descendants of the original farmer. 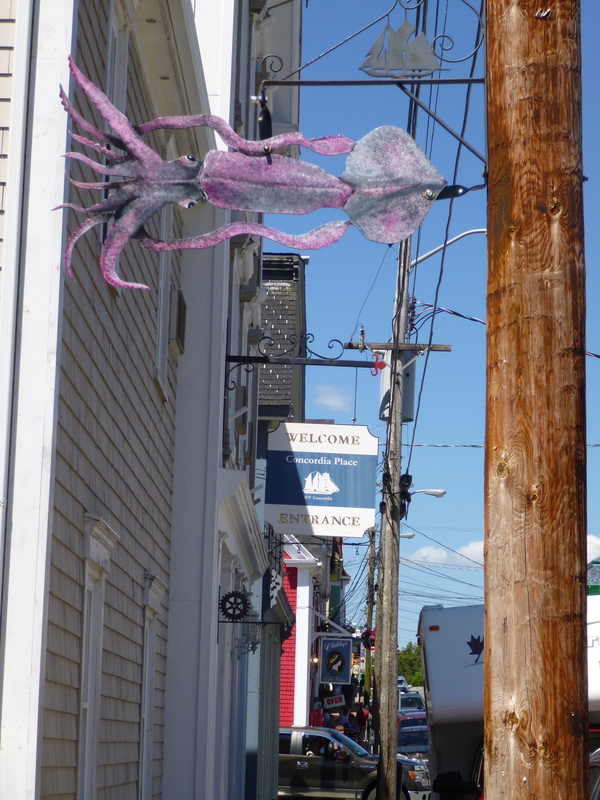 An example of the whimsical sea creatures that decorate the light standards along the quaint and narrow streets of downtown Lunenburg. There are a surprising number of things to see in the small ‘Burg of Lunen’ so having only a day meant some hard choices. 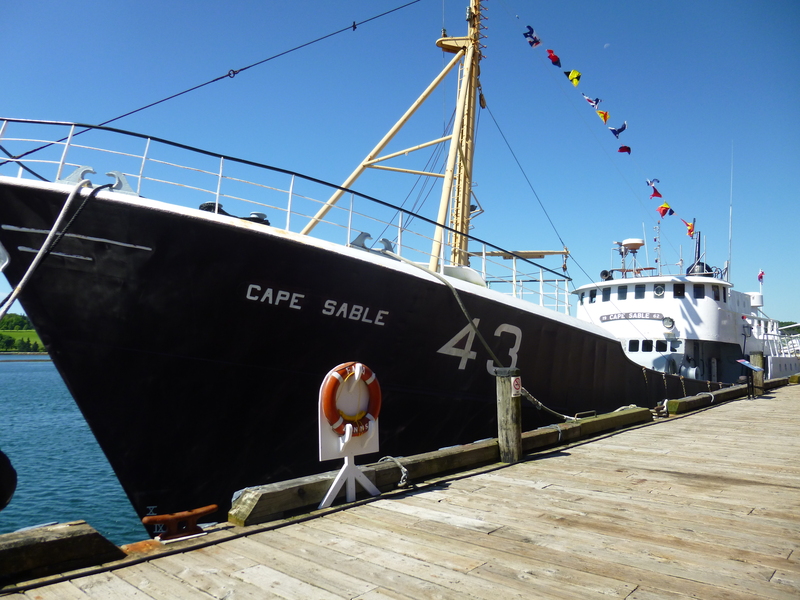 The Fisheries Museum of the Atlantic was a good pick that included not only very interesting displays of ships, ship building and the fishery but self-guided tours of two fishing vessels – a modern day side trawler, Cape Sable and the vintage saltbank schooner, Theresa E. Connor – moored alongside the pier. 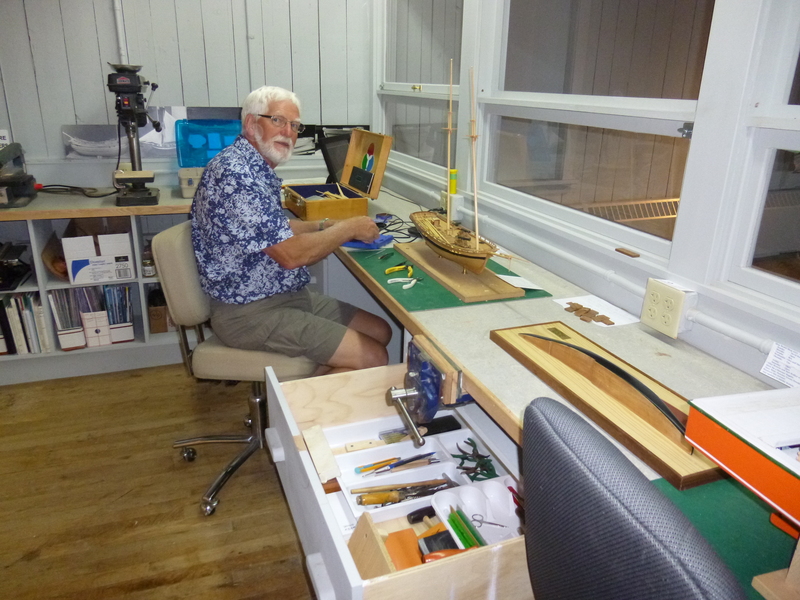 Retired fisherman and sea captains are always on deck to provide insight into the workings of a side trawler and to share stories about being at sea. 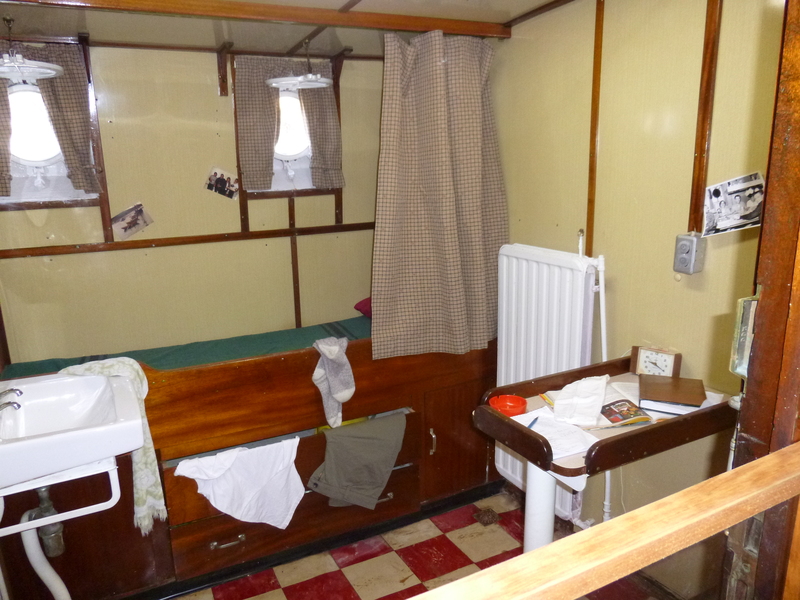 Captains locker on the Cape Sable. Cozy but functional. 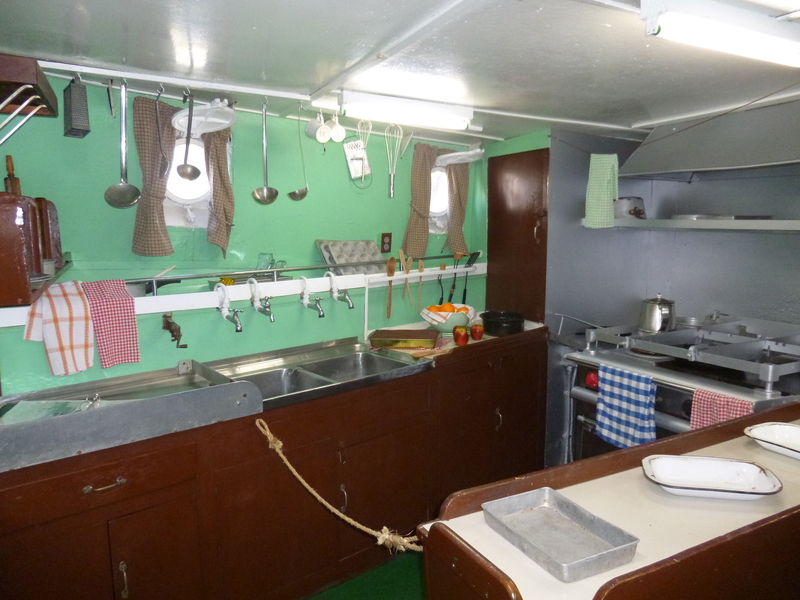 The kitchen – or mess – on the Cape Sable. Note the metal rings around the stove and counters to keep pots and pans from sliding off. This trawler would be at sea for as long as thirty days at a time. 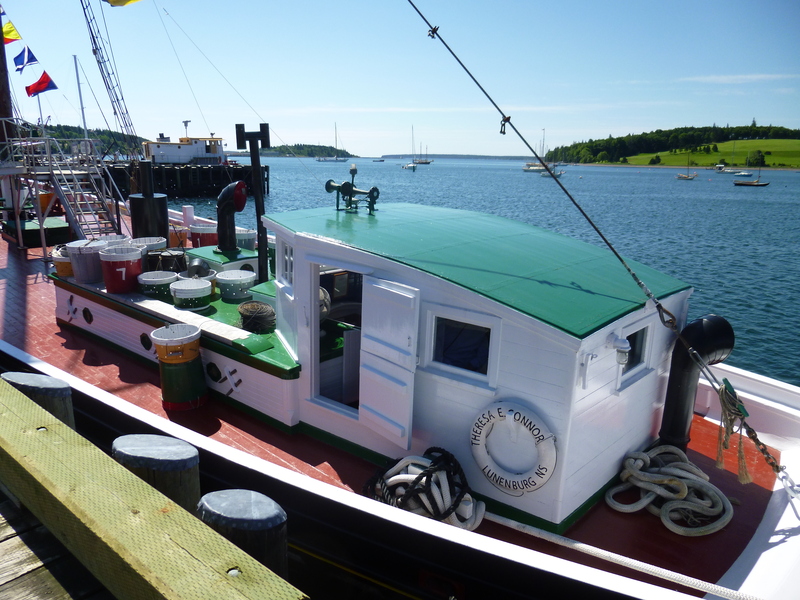 The Teresa E. Connor – ‘the last of the once great Lunenburg saltbankers’ – this dory fishing schooner was built at Lunenburg in 1938. Two-man dories would heave away from the schooner and bob in the rolling seas, trawling with hook and line. She was retired quietly in 1963 when not enough men would sign on to make any more trips. Hook and line trawlers were eventually replaced with huge net trawlers. 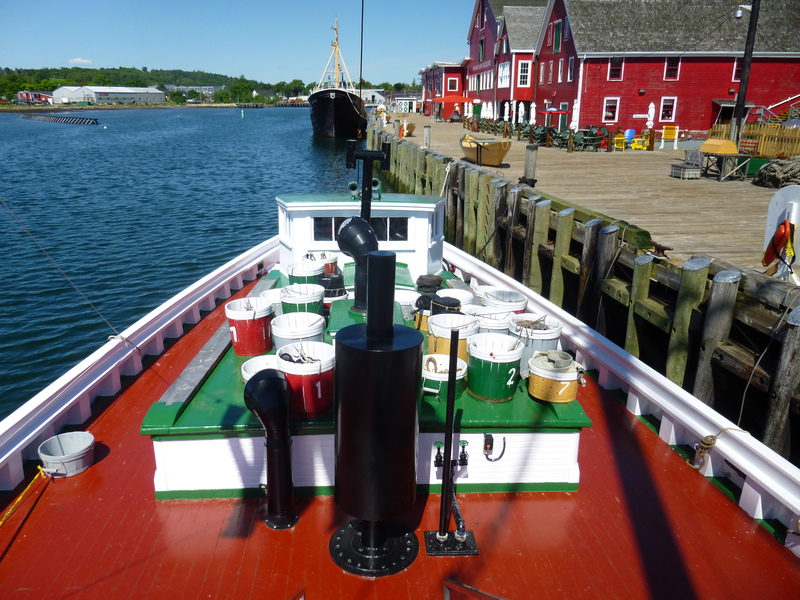 Fish buckets on the deck of the Theresa E. Connor were numbered to match the dory so the daily catch could be properly allocated. 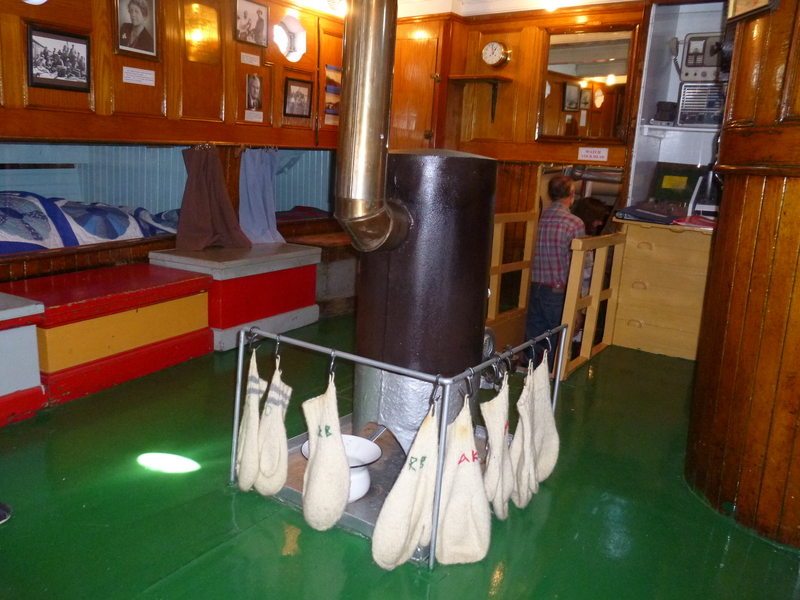 Main cabin of the Theresa E. Connor – mitts drying around the stove that must have provided a meagre heat source to frozen fishermen through the wintery North Atlantic fishing season. 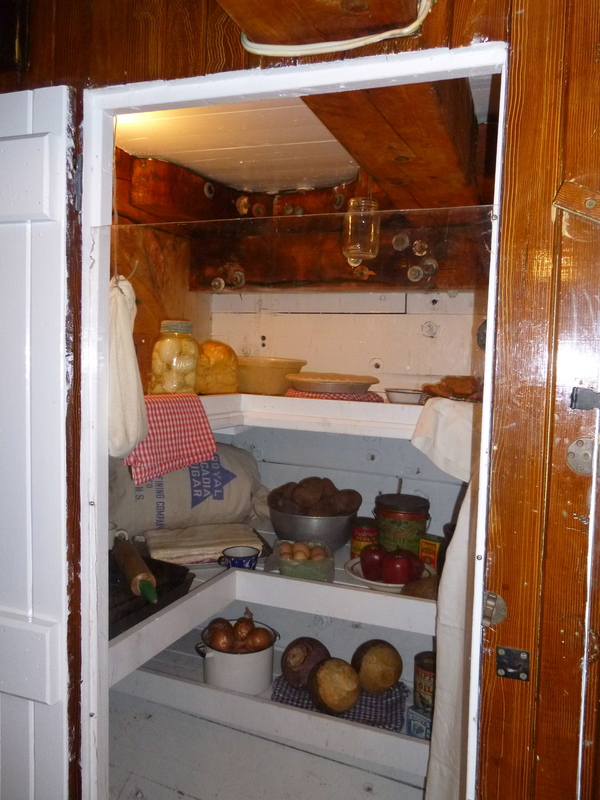 The hull of the schooner formed one big room for cooking, eating, living and sleeping, with a double row of bunks lining the sloping walls. 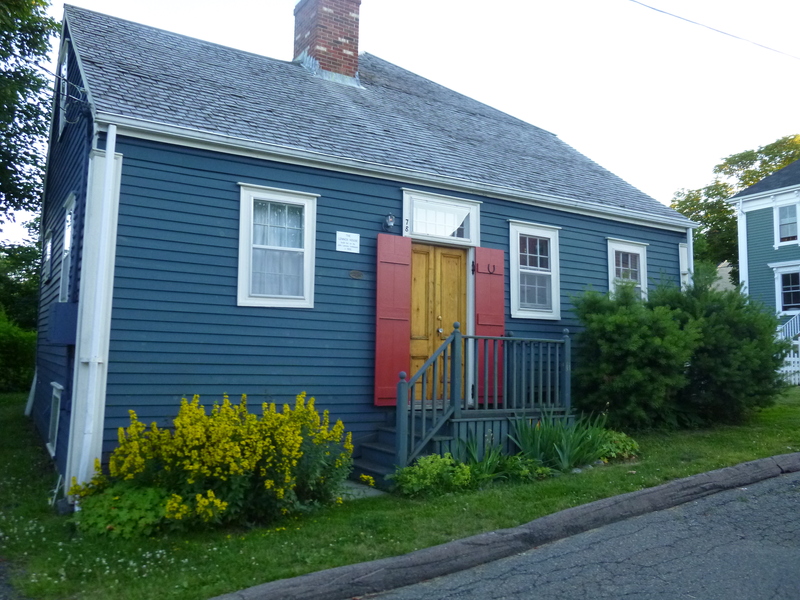 ‘Bluenose’ was an old and descriptive term for a Nova Scotian, originating sometime in the 18th century. So when the graceful schooner was built by Nova Scotians in 1921 it seemed perfectly appropriate that she, too would be a “Bluenose”. 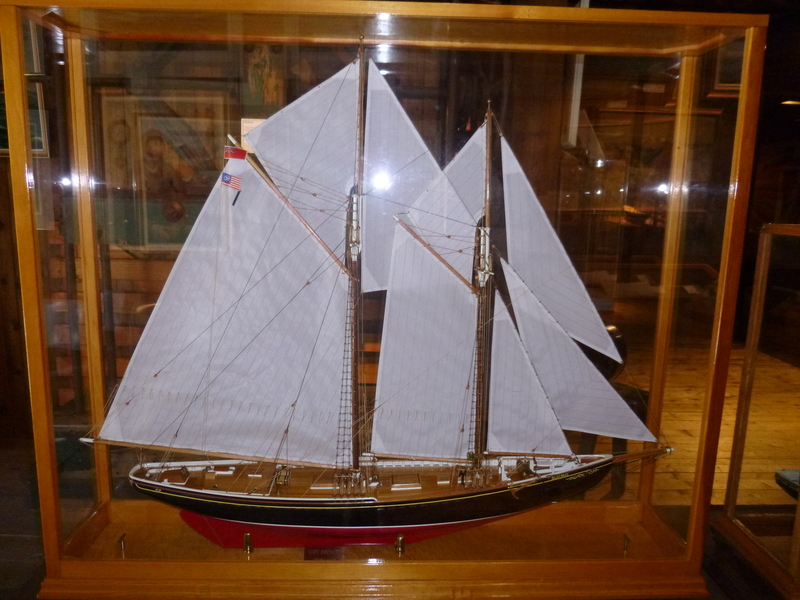 The decision to build her came after Nova Scotia lost the International Fishing Challenge Cup to an American schooner in a 1920 race sponsored by the Halifax Herald newspaper. The Bluenose lived up to expectations and in the year she was launched she did defeat her American rival… and proceeded to win the cup for 17 of the next 18 years. 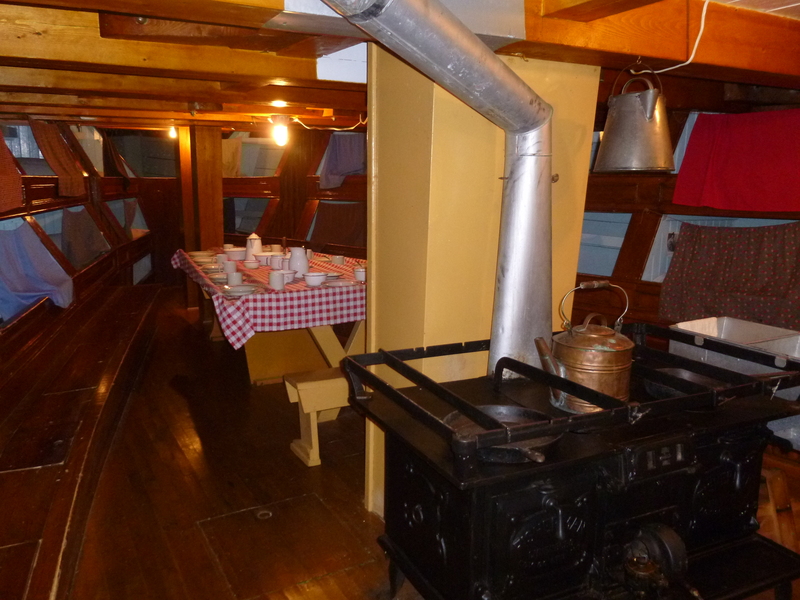 The Bluenose was also a working fishing vessel until fishing schooners were replaced by motor trawlers in the 1930’s. She was sold to work as a freighter in the West Indies where she struck a reef on January 28, 1946 and was wrecked beyond repair. The Fisheries Museum hosts a large display of model ships – many constructed on site – from small fishing boats to large ocean liners. The Bluenose II was built in Lunenburg in 1963 as a promotional project for Oland Brewery to promote their flagship brew – Schooner Lager. 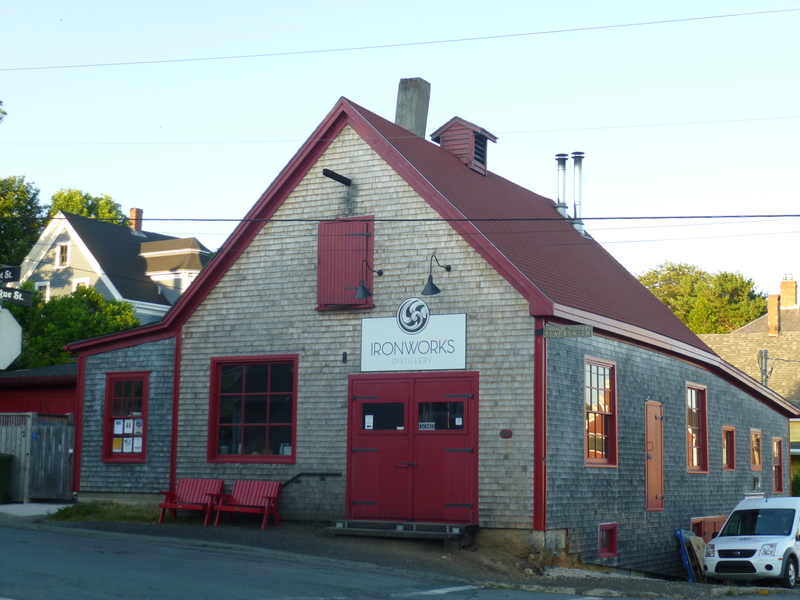 I drank a few pints while in Lunenburg as a tribute to the place and the great ship. Lovely. 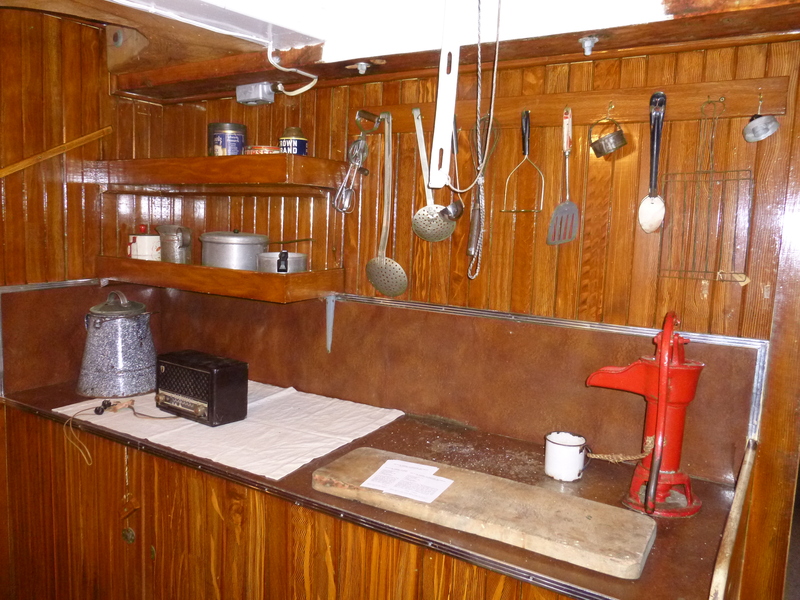 The Oland family sold the ship in 1971 to the government of Nova Scotia for the princely sum of ten Canadian dimes, and it is currently being fully restored. 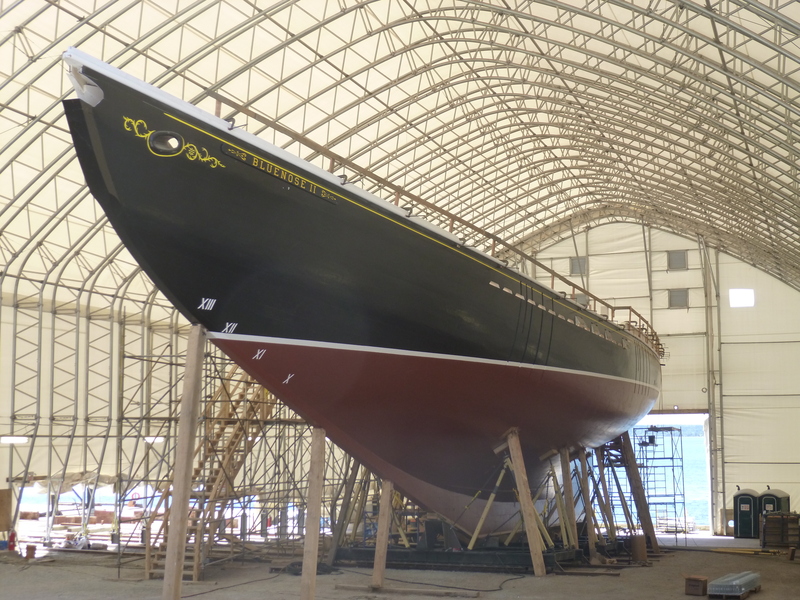 The Bluenose II is scheduled to be re-launched in September or October this year. 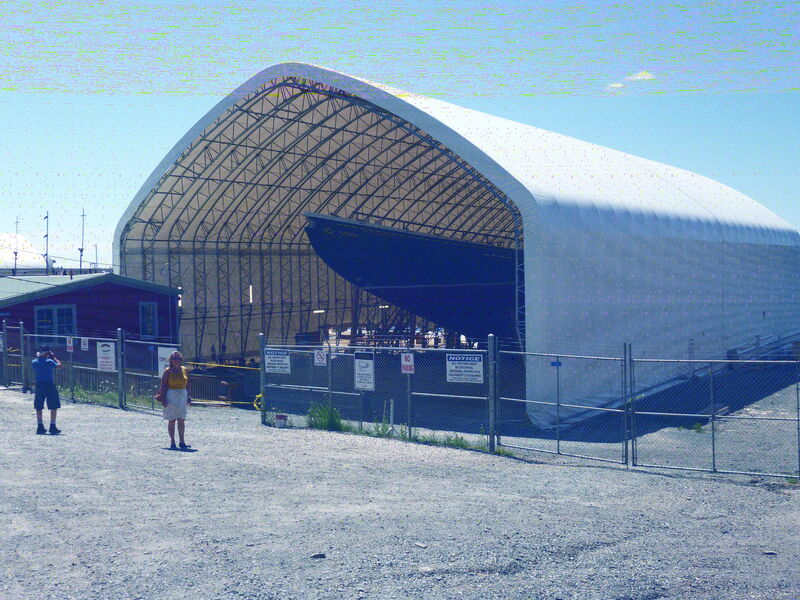 The Lunenburg Shipyard Alliance was formed to complete restoration of the Bluenose II. Progress can be viewed at various stages along the Lunenburg waterfront. A shapely lady. I wonder why ships are almost always referred to as ‘she’ and not ‘he’? 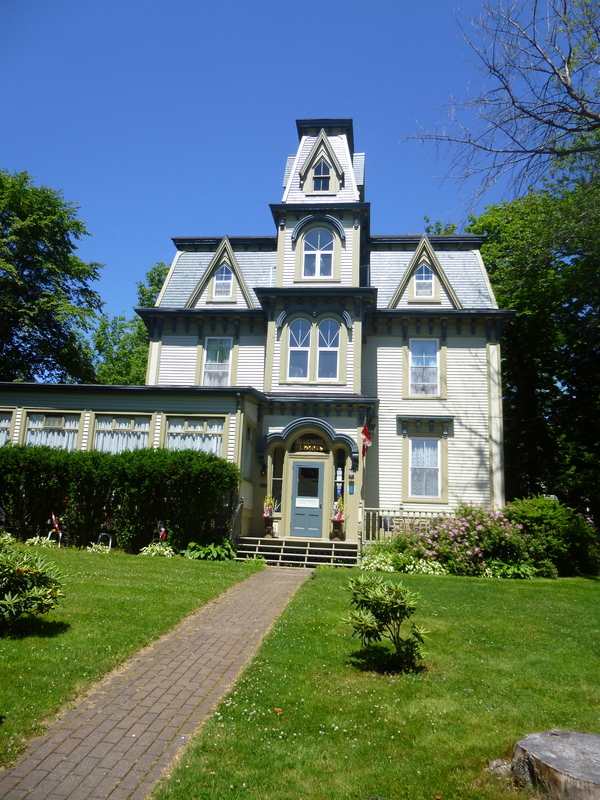 Of all the many lovely B & B’s in Lunenburg, the Bluenose Lodge seemed most in keeping with the theme of this first visit. It was heartening to chat with the innkeepers, a young, professional couple who had always dreamed of owning an inn here and who are lovingly and tastefully restoring this treasure. After a couple of years they are “making it” but still have income from his full time job and are not ready to give that up yet. 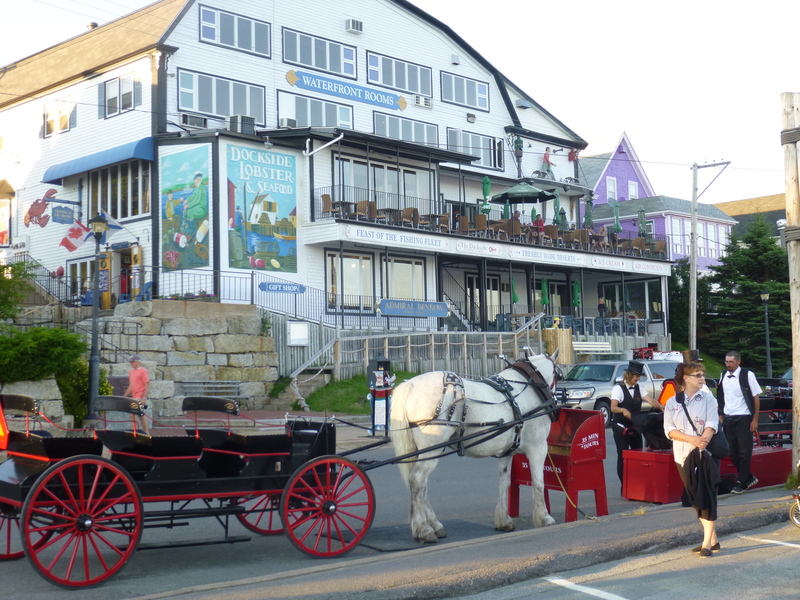 The inn is nicely located, a short walk down a path to the harbour, on a lovely treed property with the happy sounds of kids swinging in the backyard. I highly recommend it. I feel like I’ve just been in this interesting town. Everything has been described so beautifully with lots of historical information. Nice website and blog thank you for posting it.